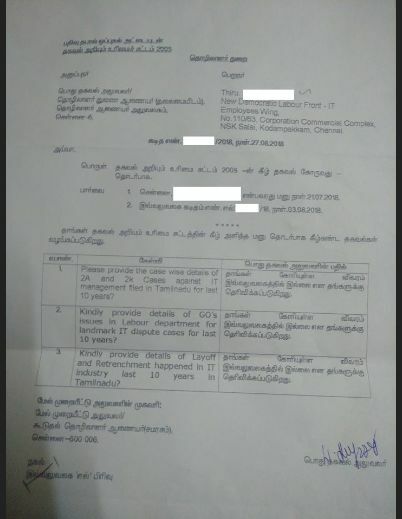 As part of union initiative we have raised various queries to labor department under Right to Information act on retrenchments happening across Tamil Nadu in various IT companies. Interestingly labor department has replied for all the above queries that their office does not have details requested. This answer gives a very clear view that IT managements are doing retrenchments without getting any permission from labor department. This includes TCS layoff plan of 25,000 employees in end 2014, Wipro band intertia plan for senior employees, Cognizant letting more than 6,000 employees go, Tech Mahindra forcing many employees to quit. Even though the figures refer to all India estimates, a considerable number of layoffs would have happened in Tamil Nadu. If you read my “IT Employees Life – Fun or Problems”, you would know that the most fundamental pre-requisite for any company having more than 100 employees is to inform labor department about the retrenchment plan and get their permission before doing retrenchment. Verizon using bouncers for doing retrenchment or Cognizant’s involuntary retrenchment plan as per Raj Mehta were not formally communicated to labor department as per the reply we have obtained. We discussed the RTI reply in our union meeting last month and as per our honorary president Subha Thangarasu advice, we are proceeding to seek legal steps in this regard. As the first step, we are taking up the plan of Cognizant to let go senior employees based on news reports quoting their president Mr. Raj Mehta. The problem is many of the companies are not seeking any legal permission and retrench employees as they wish. High level officials in CEO category wear only the management hat that they got from management schools and forget legal aspects. Some of these top category people are based in US and other foreign countries and not checking local law of land. I feel they are doing this in ignorance and legal team in each management should come forward to educate the legal aspect to top management people to avoid such scenarios. Management want to isolate layoff target employees away from other employees who are in projects. If they are isolated, whatever happens to people in bench will not be known to other people who are in projects. Bench psychologically makes employee week and if they get harassed continuously by HR officers, there is a high chance that employee will submit resignation on their own. If employee resists to resign, some companies submit back end system generated resignation in the name of employee itself. This will not be known to others and employee will be sent out in the name of attrition. If employees are still courageous enough to face layoff threat and resist to resign, some companies are even trying false compliance complaints with cooked up stories like assault, sexual harassment etc. People will feel we exaggerate things but unfortunately sexual harassment is easy weapon for targeting employees in some of the companies. Management cannot terminate any employee for being in bench for longer time. Being in bench is not any compliance violation and people getting placed is a combined effort of sales team responsible for getting new business, higher management, resourcing team, talent development team for cross skilling/development and employee himself/herself. Punishing employee alone for being in bench is absolutely not acceptable. So if management asks any employee to resign quoting reason as being in bench, don’t submit resignation. From employee side, please understand that all your activities are monitored when you are in bench and any compliance violation will be blown to big bubble to terminate you. We are repeatedly insisting that companies resort to retrenchment without getting consent from labor department which is illegal. The answer from labor department for RTI proved that our argument is correct. So if employees are targeted for retrenchment, be certain that the retrenchment is illegal and take the legal fight against the management. You may imagine that corporates are powerful and it will be difficult to challenge them in court but in reality if several thousand employees fight against this unethical procedures as I mentioned in my book, automatically things will change. Unfortunately all IT companies consider desktops and air conditioners as assets and employees as resources. Employees can push corporates to back foot only by uniting ourselves together and taking up fight against such practices. Our kindergarten school lesson about 4 bulls and a lion teaches us the strength of union. So if you are affected with layoffs or any other work related problems contact our union and seek support. Cognizant (CTS) forced resignations : Employees Fightback! Cognizant (CTS) President Rajeev Mehta says No Retrenchments – Really? Cognizant (CTS), TCS, now Wipro – Should We Accept this as Normal? Cognizant (CTS) torturing its employees – Mafia fashion!